Never be stuck without the necessities traveling with a motorcycle luggage bag. Carry a bottle of water or a change of clothes in sissy bar bags. 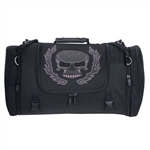 Leather Bound in New Jersey has a great selection of sissy bar bags and travel bags in a variety of styles and designs. Many come with features such as internal gun storage pockets, rain covers and lots of pockets. 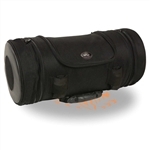 Our sissy bar bags fit most Harley Davidson, Honda, Kawasaki, Yamaha and Suzuki, motorcycles. If your local ride into our Pensauken New Jersey Super-store and try different bags on your motorcycle before you purchase so you find the best bag for your needs.